NEW YORK, New York — Through the sponsorship of Moscow industrialist and Hayastan All-Armenian Fund Benefactor Member Armen Shakhazizyan, the fund is implementing extensive renovations at Stepanakert’s Sayat-Nova Music College. 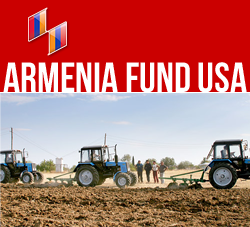 The project is co-sponsored by the government of Nagorno Karabakh. The refurbishment of the Sayat-Nova Music College, which has a total area of 1,925 square meters, comprises major structural and cosmetic improvements. To date, the building has been reinforced and thoroughly redesigned, and its exterior has been overlaid with marble tiles. When renovations are completed within a few months, the beautiful landmark, which was built in the Soviet era, will be transformed into an ultra-modern educational facility, complete with well-lit staircases, a state-of-the-art auditorium, and soundproofed classrooms. Hakob Gyulgyulyan is the coordinator of the project.